126 people died, and 40 riverside homes were ruined, when a consignment of gunpowder exploded at the quays. 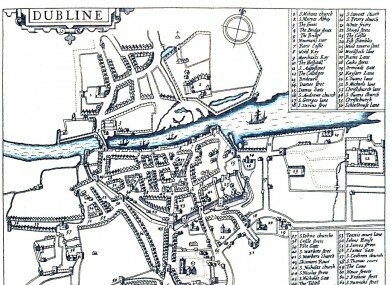 A map of Dublin from 1610. The site of the 1597 explosion is just to the left of the centre. TODAY MARKS the anniversary of one of the worst single tragedies in the history of Dublin city – an explosion that killed over 1 per cent of the capital’s entire population. 126 people died in the Dublin Gunpowder Disaster, which struck in the area around the site where the modern headquarters of Dublin City Council are located. In 1597 this area was around the centre of the city, which had a population of around 10,000 – and marked the point where 140 barrels of gunpowder exploded in a shipping accident on March 11 of that year. Gunpowder was being shipped to Ireland to supply the English army, which was fighting the ‘Nine Years’ War’ against Irish clans to assert British control over the island. It was common for ships to transfer their load to barges off the shore, and for those barges to carry the loads into shallow water. The explosion effectively ruined the area around Fishamble Street and Cook Street – with dozens of riverside homes destroyed – while areas further afield also suffered damages due to the rain of debris caused by the massive blast. Worse, however, was the discovery of the body parts of dockside workers in the areas near the scene – with those working to unload the gunpowder killed instantly by the devastating scale of the blast. The cause of the explosion was never formally identified, though the Irish History Podcast summarises that the days before the blast had seen tensions between Dublin Castle authorities and porters over the working conditions of the latter. An informal strike had followed, which had left a backlog of gunpowder waiting to be moved from the docks – which contributed to the sheer scale of the disaster. The accident was the catalyst for the dramatic expansion of the city, however – with the older timber buildings replaced by brick, while the reconstruction of the area resulted in development moving east along the quays towards the modern city centre. That land had been newly reclaimed, and the expansion of the ‘central’ city area allowed a dramatic growth in the city’s population. By 1700 the population had grown to 60,000, making Dublin the second biggest city in the British Empire. Email “416 years ago today: Explosion kills 1pc of Dublin's population”. Feedback on “416 years ago today: Explosion kills 1pc of Dublin's population”.